How Does a Piece of Corrugated Board Become a Box? Glad you asked! Once a corrugated sheet is taken off of the corrugator it is ready to be converted into a finished corrugated product. At the end of corrugator, a slitter-scorer trims the corrugated board and cuts it into large sheets called box blanks. The sheets have been slit to the width of the blank, which will be the height of the box, scored across the flutes (along the Machine Direction), and cut to the approximate length of the blank. In order to make a blank that will fold to form a box, it is necessary to score and slot it. Scoring is defined as the creases that cross the flutes and is generally done at the end of the corrugator. Slotting removes the narrow slice of board from between the flaps and is necessary to permit the flaps to fold. Box blanks are produced by the slitter-scorer and slid into an automatic stacker that loads them onto a large, rolling platform. From here, they will be transported to the other machines that will convert them into finished containers. Production workers then use a computer terminal and printer to prepare a job ticket for each stack of box blanks produced by the corrugator. With the job ticket, workers can route the stack to the proper converting machinery. There are 3 types of converting machines: Printer slotters, flexo folder-gluers, and die-cutters. A printer-slotter only scores and cuts in straight lines, making it the most simple of the converting machinery. The printer-slotter is so named because it can print graphics onto the board before slotting it. The flexo folder-gluer is named for its ability to fold and glue a box blank to form a completed box. The flexo folder-gluer produces only one box per sheet. From the flexo folder-gluer, the finished boxes are automatically stacked and sent to a banding machine to be wrapped in bundles for shipping. Die-cutters are used to make unique designs or unusual cuts, slots, scores, vents, hand holes and perforations. 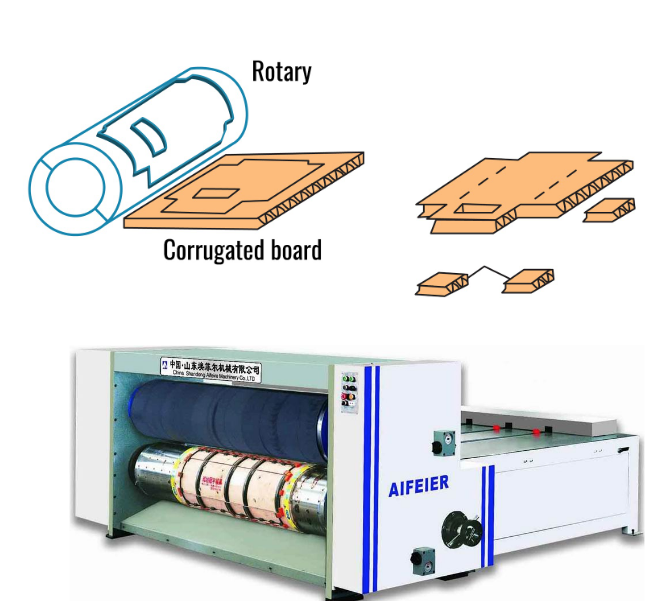 There are two main types of die-cutters, rotary and platen. Rotary die-cutters use continuous motion, feeding the sheets between two cylinders: one with the specific die pattern that produces the desired cuts, and the other that acts as an anvil. Platen die-cutters make cuts using an up-and-down motion. Unlike the flexo folder gluer, die-cutters leave the box unglued and flat. Die-cut boxes, such as pizza boxes, are typically formed by hand or wrapped around a product and joined on a customer's equipment. Unlike the flexo folder-gluer, the die-cutter has ability to produce multiple boxes per sheet. Knowing what you desire as the end goal for your package will guide you as far as deciding what companies to choose to provide the materials needed. Research is required to determine what will be the most cost efficient route to obtain the correct corrugated product. Most often, it is cheaper to go with the integrated companies where they have the ability to control prices to a greater extent than the smaller suppliers. But, depending on time constraints and geographical locations, you may find suppliers that can cater to your specific needs with a piece-by-piece solution. Do your research, ask lots of questions and make sure you understand what will be presented to you at the end of an order. To learn more, check out our 100% online Corrugated Containers course.